Home » Health Information » Prostate Health » What is Prostate Cancer? 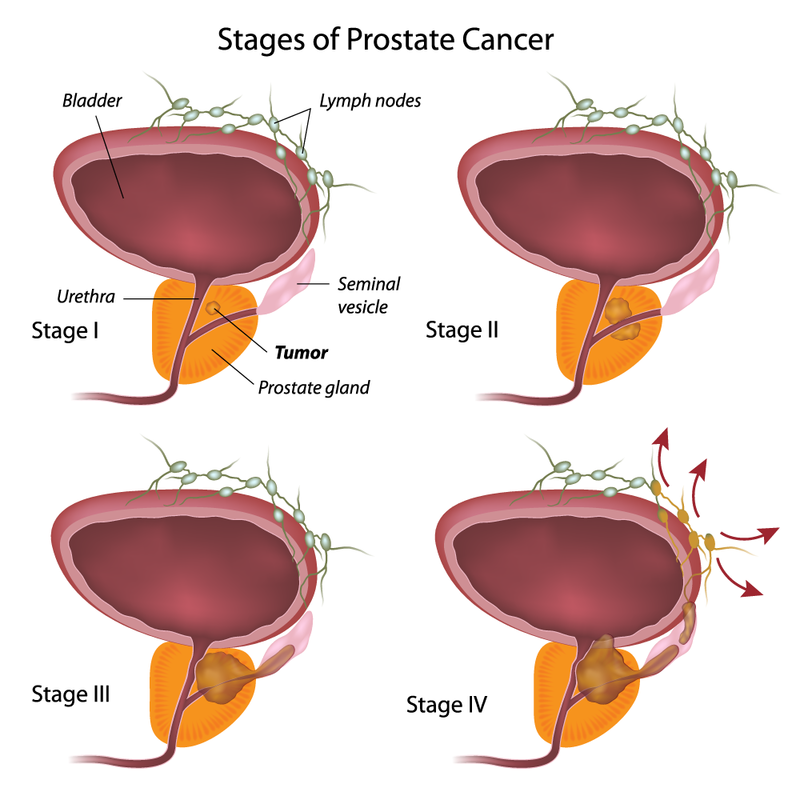 Prostate cancer is a malignant tumour that forms in the prostate gland. A man may not experience any symptoms, especially in the earlier stages of the disease. Prostate cancer may be found by a PSA test or digital rectal examination. A PSA test is a simple blood test that measures the amount of the protein prostate-specific antigen. During a digital rectal examination, the doctor feels the prostate gland with a gloved index finger for any irregularities. What are common symptoms of prostate cancer? While it’s fortunate that prostate cancer is a slower-growing type of cancer, it can spread (metastasize) to other parts of the body such as the lungs, bones and liver. If you experience any symptoms of prostate cancer, or you’re due for prostate testing, discuss your options with a men’s health provider. We’re constantly hearing news about cancer-fighting foods and supplements that can reduce your risk of developing the disease. But, with so many different reports and recommendations, how do you know which preventative measures are safe and effective, and which ones aren’t? The answer: proven research. A study of over 40,000 health professionals showed that men who ate more than 10 servings of tomato-based foods daily (like cooked tomatoes and tomato sauce) had a 35 percent lower risk of developing prostate cancer than men who ate fewer than 10. However, remember that you can’t believe everything you read! There was a large study published recently that looked at the effectiveness of vitamin E and selenium in preventing prostate cancer. Discuss safe and effective prostate cancer prevention with a men’s health provider. How do you prevent prostate cancer? One of the most common discussions people have with their health care provider is about lowering their risk of developing certain diseases. Your doctor might recommend making diet and lifestyle changes, or prescribe preventative medication. If you have a higher-than-normal risk of developing a disease, chemoprevention may be a viable option. The Prostate Cancer Prevention Trial (PCPT) was a study done in men 55 years and older, to determine whether or not the drug finasteride could prevent prostate cancer. The PCPT was funded by the National Cancer Institute (NCI), and looked at 18,882 men over a three-year-period. The Reduction by Dutasteride of Prostate Cancer Events (REDUCE) study was an international clinical trial that looked at 8,200 men ages 50 to 75, from 250 sites in 42 countries. Men younger than 60 needed baseline PSA values of 2.5 to 10 ng/mL, while men older than 60 needed values of 3.0 to 10 ng/mL to participate. A great deal of research is needed to understand chemoprevention, which is why it is still in its early stages. Find out more about chemoprevention from health care providers near you. Do the benefits of testing for prostate cancer outweigh the potential harm? Even experts can’t agree on the issue of medical testing for prostate cancer, so how do you make an informed decision when it comes to your health? “There’s a lot of controversy about prostate cancer screening,” says Dr. Peter Black, a urologist active in the Men’s Health Initiative of BC. “We do have a couple of tests: one test is the PSA – the prostate-specific antigen, which is a protein made by the prostate that is in the blood. Then, we have a rectal exam where the physician feels the prostate. Now, these tests do pick up prostate cancer, but they’re not very exact, so there’s a lot of controversy whether prostate testing is actually helping men, or just leading to more tests that may actually harm men. Men who are considered at high risk of developing prostate cancer should also consider PSA testing. Men at high risk include those with brothers, uncles, a father or grandfather with prostate cancer, and African-Canadian men. Research suggests that eating a diet high in fat may also increase a man’s risk of developing prostate cancer. Are you at risk? Discuss PSA testing with a men’s health provider near you. Click here for information about the main Prostate Cancer Treatment Options.